Sir William Waller (1597-1668), son of a Lieutenant of Dover Castle, was one of the first Parliamentary leaders to take the field. He saw successful action at the end of 1642 in Dorset, Hampshire and Sussex: and as a direct result Parliament placed him in command of the army of the Western Association (Gloucestershire, Wiltshire, Somerset, Worcester, Shropshire and the city of Bristol) upon its formation on 11 February 1643. When this army was largely destroyed at the fateful battle of Roundway Down (13 July 1643), Waller moved on to take command of the South Eastern Association army (Kent, Surrey, Sussex and Hampshire) from its beginnings in early November 1643. Since his forces now consisted of both Association troops and those of the London Trained Bands, Waller had great difficulty in keeping his army intact in the field. The London regiments-by far the strongest available to Parliament-would only serve for short periods, and were not to be relied upon for service in lengthy campaigns. The commercial life of the city virtually came to a standstill when the Trained Bands marched out of London; and those who held the purse-strings were constantly pressing for their early return. An ordinance passed in March 1644 went some way towards stabilizing the fluctuating strength of Waller's forces, by providing for the raising of an army for him which would serve more permanently and in sufficient strength to counter the Royal army. Waller's new army saw action at Cropredy Bridge (28 June 1644) and at the second battle of Newbury (27 October (644). At Second Newbury Waller's forces outnumbered those of the king two to one, yet were still unable to force a decision. This experience, coupled with his unhappy memories of local armies which fought bravely to defend their own country but would not move outside it, must have crystallized Waller's belief that the war could never be won until Parliament had an army which could be relied upon to serve when, where, and for however long the military situation dictated. Waller's views were widely shared among senior Parliamentary officers, and events came to a head in December 1644 when Oliver Cromwell made a major speech calling for a remedy to Parliament's military failings. Much debate followed, but as a direct result of Cromwell's speech the formation of the New Model Army was sanctioned on 4 February 1645. The Self-Denying Ordinance, which was passed by Parliament on 3 April 1645, forbade members of either House from holding military rank or office. This vital reform swept away much of the 'dead wood' from the hierarchy of Parliament's armies, leaving the field clear for the professional soldiers-such as were available. Ironically enough it also swept away Waller himself-but with him went other and far less able men. The new army was formed under the command of Sir Thomas Fairfax (1612-71), an experienced soldier of courage, intelligence and integrity. Between 1645 and 1660 a number of new regiments were raised. In all the New Model had some 28 regiments of horse, 62 of foot, and four of dragoons; not all these were in existence simultaneously, but the majority were. 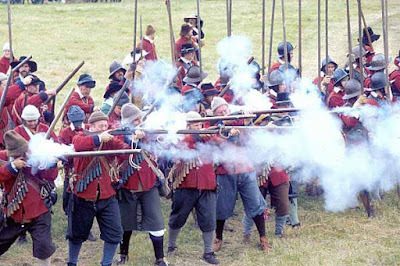 From the small beginnings of 1645 grew an army which, although naturally of variable fighting quality, generally proved to be of impressive battlefield value, and which laid down the organizational and tactical blueprint for the Restoration army of King Charles II, and thus for the generations of British soldiers who came after them.